Hello everyone welcome to Backup Software Review. Today I am going to review the new SQLBackupAndFTP, a powerful SQL database backup for Windows. I am testing this SQL backup software on my Windows 10 Professional. Please note that this SQLBackupAndFTP Review is not an advertisement and we are not endorsed or paid by the developer. Many people asking what is the best SQL Backup Software in 2017? 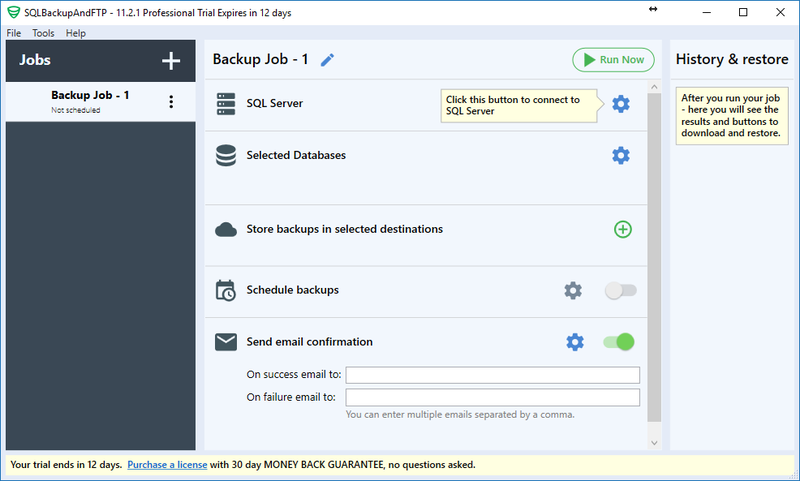 If I was asked, I would like to recommend this SQLBackupAndFTP as one of the best SQL Backup Software in 2017. SQL Database backup is an essential and critical task for you to protect your valuable data from unexpected data loss. There are many reasons that can cause data loss, for example hacker attack, viruses, ransomware and many others. So, make sure your have a regular database backup system on site. There are many software that can do the backup task more efficient. 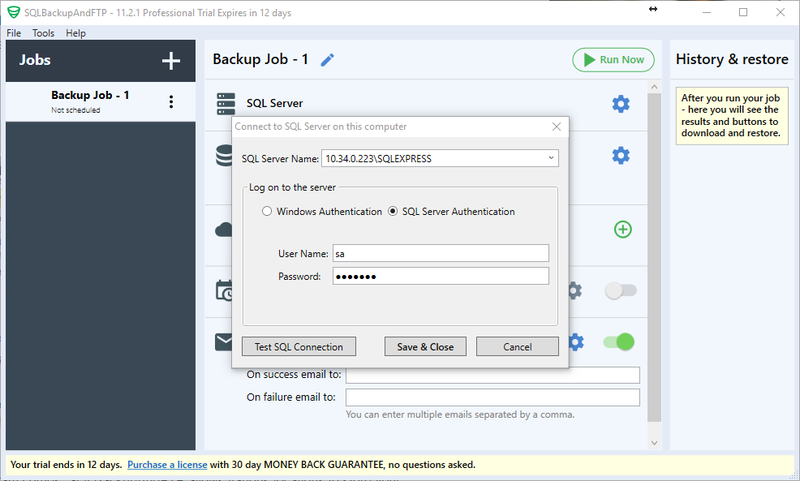 If you are new to SQLBackupAndFTP, please continue reading to find out more information about this great SQL Backup software. SQLBackupAndFTP is an excellent Microsoft SQL Server backup tool. It allows us to perform backup to multiple database at once, simple and intuitive user interface and its very easy to use. Additionally, this software supports cloud storage destination such as Amazon S3, Google Drive, Dropbox and many more. You can also save the SQL backup file on an FTP Server. The new version 11.2, it comes with a redesigned user interface. Its way easier to use. As you can see on the left panel is the backup job list. The right panel is the detailed settings for each jobs. As we mentioned previously, it supports local and remote SQL Server. Storing backup in a cloud storage is an important way to keep your data secure and accessible for everywhere. SQLBackupAndFTP supports various cloud storage such as Amazon S3, Google Drive, Dropbox, OneDrive, Box and Microsoft Azure. You can download SQLBackupAndFTP for free with some limitations. If you want more power, we highly recommend you to upgrade to standard of professional version. The free edition is limited to 2 databases, folder and FTP destination. For download and more information, please visit the official website. You may compared this software pricing and plan with SQL Backup Master which also performs great on SQL database backup. As a SQL Database administrator, backup is another important task. Make sure you have a good backup software that is reliable and easy to use. 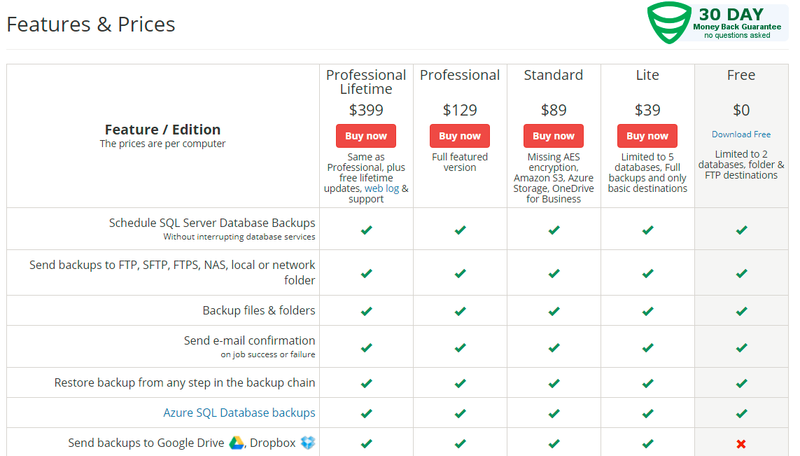 SQLBackupAndFTP offers many features at affordable price for SQL server backup. The cloud storage support is another benefit you can get with this software. Multiple databases and multiple backup jobs will make your job a lot easier.